Cindy Tinny Kozil, Gamma Beta – University of Connecticut, was first encouraged to support the Delta Zeta Foundation as an undergraduate at a Region Weekend. That first gift, in honor of Delta Zetas in her life, created a lifetime of giving of both time and treasure to an organization she helped recolonize at the University of Connecticut. Cindy joined Delta Zeta in September as the first new member class of a new colony, and she served as Recording Secretary, Vice President of New Member Education and as a Chapter President. Cindy’s support of Delta Zeta with both talent and treasure has ebbed and flowed over the years, depending on what was going on in her life. Cindy is a proud member of the Guy Potter Benton Society and decided to join that society after attending a Norma Minch Andrisek Leadership Conference as a panelist. She was so impressed with what the Sorority was doing for leadership programming, she wanted to support that. She also had the pleasure of meeting Norma Minch Andrisek both at a Gamma Beta Chapter event and at the leadership conference. “She was such an amazing woman who gave so much to Delta Zeta,” Cindy said, referencing Mrs. Andrisek. Because of her involvement with Delta Zeta, upon graduation from the University of Connecticut with a degree in Communication, she went on to receive a Master of Education degree in College Student Personnel at Eastern Illinois University. While in graduate school, Cindy advised the fraternity and sorority community and programming board, as well as worked in residential life. 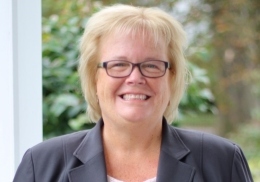 Cindy has had a career in higher education spanning more than 25 years, and currently serves as the Vice President, Student Development and Retention at Dean College in Franklin, Massachusetts. The fraternal connections continue in her family with her son, a current member of Phi Gamma Delta at the University of Tampa, where he will serve as the 2019 Interfraternity Council President. Cindy wants all Delta Zetas to know that there is no such thing as a small gift – that every gift matters. Cindy believes “empower the woman” means women supporting women – showing women that they can do anything. It means helping them set and reach goals and nurturing, mentoring and supporting each other. Your gift to the Delta Zeta Foundation provides for the future of Delta Zeta – and creates opportunities in leadership and a lifelong commitment to Delta Zeta, just like it did for Cindy. By giving graciously, you ensure our members are helping to create the premier women’s organization.